To provide a number of individual improvements to the A32 to improve access to the new regional hospital in Enniskillen. The A32 is the principle route between Omagh and Enniskillen and passes through the towns of Dromore and Irvinestown. Now that there is a plan to replace the acute functions of Omagh's Tyrone County Hospital and Enniskillen's Erne Hospital with a new hospital to the north of Enniskillen, the government has planned a series of seven improvement schemes for the A32. The work is taking place over a period of years. As of June 2015 three schemes are completed, and four more are planned. 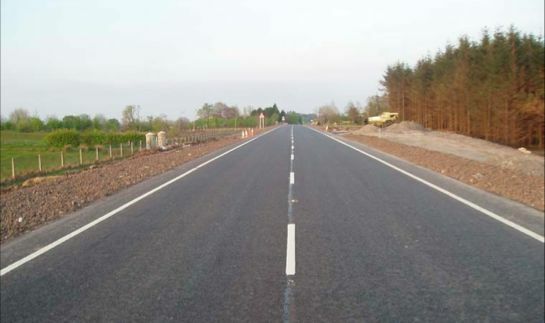 The process began in 2007 when Roads Service Western Division carried out a review of the A32 between Omagh and Enniskillen and made a list of 15 potential schemes. In 2008 these were whittled down to 9. Two of these - Sidaire and Drumbulcan - were subsequently dropped, giving a final total of 7 schemes. Main contract awarded Jan 2012. Work began 5 Mar 2012. Officially opened 13 Feb 2013 (ahead of Mar 2013 due date). Between Dromore and Irvinestown Advanced site works took place early 2010. Main contract began Sep 2011. Completed Mar 2012.
immediately west of Dromore town Stage 1 report approved 13 March 2012. Stage 2 report approved 27 Feb 2013. 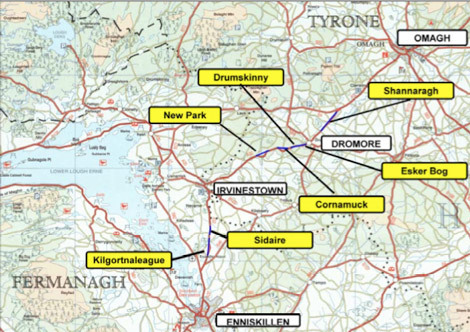 £6m (as of Mar 2016) Between Dromore and Irvinestown Stage 2 report approved 13 Mar 2012. £7m Between Irvinestown and Enniskillen Design work underway. Preferred corridor to be announced "during 2015/16" (as of Jun 2015) - which never happened (as of Apr 2019). The map below shows the location of all but the first of these schemes (Sidaire is now cancelled). These are all links to Google Streetview. 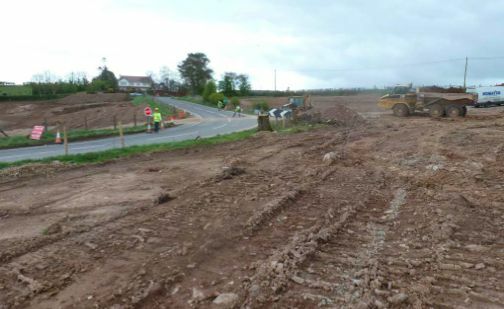 7 Apr 2019: It's now over two years since DFI "made" the Vesting Order to acquire the land for the Cornamuck scheme, and there is still no sign of work getting underway. The Investment Strategy for Northern Ireland Pipeline had been tweaked to now suggest that the scheme woudl go out to tender in March 2019, but that date has also come and gone. The only explanantion that I can see is that the scheme has not got funding to proceed to construction. It may be possible for a senior civil servant to approve it with the powers that they now have in the absence of a Minister - at £4-6m it's a very cheap scheme compared to others. I have not been in the area for some time - if anyone who uses the road can tell me if there's any indication of work, eg tree felling, please let me know! roads at wesleyjohnston dot com. 23 Jun 2018: This continues to be one of the most painfully slow multi-component schemes on the road network, as we approach the tenth annniversary of completion of the first element (Mullaghbane). We've been awaiting the Cornamuck scheme, whose Vesting Order was "made" over a year ago, apparently in the hope of funding becoming available. Some vegetation clearance and archaeology DID take place during the spring (see photo below) but there is still no sign of the main contract. The Investment Strategy for Northern Ireland Pipeline contains an entry suggesting that this scheme is finally to go out to tender in December this year (2018) with a total project cost of £4-6m. The information goes on to suggest a contractor would be appointed by March 2019 with construction taking place between June 2019 and June 2020. It's worth commenting that without a functioning Executive it's hard to put much certainty in this sort of thing. The Pipeline also suggests that the next element, Kilgortnaleague, is going to be "after 2020". We're also still awaiting the "preferred corridor" for this scheme, which was to have been published in 2015. 22 Mar 2018: Vegetation clearance work appears to have been taking place in the past few weeks at Cornamuck. The Vesting Order (that gives the land needed to DFI) was made a year ago. Tree felling and hedge removal has to take place before the bird nesting season begins, so this work implies that DFI want to begin construction work on this scheme before the autumn. I don't see any evidence of a construction tender on the DFI web site, so either it hasn't been issued yet, or else this scheme is too small in scale to warrant that process. With thanks to Owen Brannigan for spotting this development. There are 7 schemes in total in this programme, and so far work has been underway for 9 years, with only 3 built. At this rate it will take two decades to complete all 7, which isn't a great record for a set of schemes that were originally justified by the need to get quickly from Omagh to the new South West Acut Hospital in Enniskillen, which has now been open for 5 years. There is no word on progress on the other 3 future schemes. 26 Feb 2017: The DFI unexpectedly "made" the Vesting Order for the Cornamuck scheme on 8 February. You can see the Vesting Order map here. A Vesting Order is a legal document that compels landowners to sell the land needed for the road. It exists in a Draft form for many months to allow all those affected to respond and make plans, and eventually is activated, or "made", which is the point at which title in the land actually changes hands to the DFI. That is what has now happened. The DFI previously said of the Cornamuck scheme that "The Vesting Order will be made when funding for the works becomes available." So that suggests that this scheme, the fourth of the seven planned for the A32, has now got funding. With the other necessary legal orders published in March 2016, and Vesting Order now made, and the money in place, there's really no reason why work cannot commence. No construction tender has appeared on the DFI web site, but it is possible that the scheme may have a low enough cost that it doesn't need to go through such a process, and could instead be built by one of DFI's "term contractors". We will have to wait and see what happens on the ground in the coming weeks. If anyone reading this happens to drive along the A32, perhaps you could let me know if you see any evidence of work at Cornamuck (which is a couple of miles west of Dromore)! 19 Oct 2016: In a Written Answer in the Assembly in July (AQW 2019/16-21) the DfI Minister gave an update on this scheme. He reiterated that the legal orders for the Cornamuck scheme had been published in March, before going on to say "This has placed this scheme in good position for delivery in the event that funding becomes available". That's not a particularly encouraging statement, as it basically means there is no money to proceed to construction, at least up to the end of the current financial year in March 2017. The Cornamuck scheme is estimated to cost about £6m. He then went on to mention Kilgortnaleague and said that "the uncertainty with regards to availability of funding, it is not intended to progress this scheme through the statutory consultation process at present given that the Cornamuck scheme is in position to take forward to delivery". What this means is that since there is no money to build Cornamuck, there's hardly any point in progressing Kilgortnaleague at the same time since it's even less likely that both will be able to proceed in the near future. In an oral question in the Assembly on 4 October the Minister added that "It is hoped that Transport NI will be in a position to identify the preferred alignment for [Kilgortnaleague] in 2017" at a cost of about £7m, a slight increase on the £6m figure given previously (It is worth reading Hansard for the brutally honest answer the Minister gave when asked if he would divert cash from the delayed A5 scheme to the A32!). Finally, the DFI's web site continues to list the "Sidaire" scheme (along with New Park and Esker Bog) as "dependent upon funding", even though the DRD said that the Sidaire scheme had been cancelled almost six years ago (see update for December 2010 below) due to escalating costs. So, all in all, not looking particularly hopeful for further work on the A32 in the near future. 13 Mar 2016: The DRD Minister announced the publication of two of the three legal orders needed for the Cornamuck scheme on 1 March. These are the Direction Order (which formally gives the DRD permission to construct a new trunk road) and the Notice of Intention to Proceed (whereby the DRD explains what they are going to do and why they think it's worth doing). What has not been published is the Vesting Order (which compels landowners to seel the necessary land to the DRD). This final legal order is usually only made when money has been allocated and construction is likely to get underway soon, because it requires the DRD to spend money buying land. The fact that they have not published the Vesting Order shows us that there is currently no funding to actually build the Cornamuck scheme. The publication of these two documents does move the scheme a little closer towards construction, but not by much since a cash allocation is the main thing that is needed to progress it. The scheme is now estimated to cost £6m, an increase on the £5m being quoted in December 2014. We are now almost ten years since this suite of schemes on the A32 was first proposed in 2006. To date three have been completed, and four remain unbuilt. 9 Nov 2015: The DRD has now put all the documents and maps relating to the recent consultation on the proposed Cornamuck scheme on their web site here. A public consultation period seems to have taken place from 26 August to 16 October, though I missed this at the time. In addition, the DRD web site now notes that TNI Design and Consultancy Services and its partner Amey are the appointed consultants to develop the Stage 1 and Stage 2 reports for the Kilgortnaleague scheme, as referred to in the June update (below). There is still no indication of any of the four remaining schemes being taken to construction - it's now almost three years since any work took place on the A32 on the ground. Interestingly the DRD's web site lists the "Sidaire" scheme (along with New Park and Esker Bog) as "dependent upon funding", even though the DRD said that the Sidaire scheme had been cancelled almost five years ago (see update for December 2010 below) due to escalating costs. So this information is either spectacularly out of date, or else the scheme has been resurrected. The fact that it appears on a recently-produced map on the DRD web site suggests that the latter is a possibility. We will have to watch and see if anything happens. 5 Jul 2015: Thanks to a very helpful chap at TransportNI, I have just become aware that a public consultation event into the proposed realignment at Cornamuck took place in December 2014. This was kept very quiet as I can find no reference to it on the Internet! However, the leaflet that was given out shows that what is proposed is basically a slicing off of the bad curve at Cornamuck by creating a new straight road between either end. Longhill Road, which will be cut in two by the new alignment, will be connected to the new road by a pair of staggered T-junctions. The "old" A32 will become a pair of cul-de-sacs accessible only from Longhill Road. 10 Jun 2015: The DRD web site was updated a week ago with a comment about the Kilgortnaleague scheme. It now says "Working to complete Stage 1 and 2 reports during 2015/16." These reports are what will result in a preferred route alignment for the 2km scheme that can then proceed to tender. Depending on how the contract is worded the contractor may be responsible for detailed design, or TransportNI may do this in-house, leaving the contractor to purely construct it. The timescale given is not as hopeful as was the case in December, with the implication that the announcement of a preferred corridor might drift into 2016. In December the Minister also indicated that the draft legal orders for Cornamuck would be published in March 2015 - it's possible I have missed them, but I don't think they have been. As far as actual construction goes, is also worth noting that the Stage 2 reports for the Cornamuck and Esker Bog schemes were completed in 2012 and 2013 respectively, and they have not yet even proceeded to tender. This suite of schemes has now been under construction since December 2008, and so far 3 of the 7 have been completed. The table further up this page summarises the various schemes. 18 Dec 2014: The Minister was asked about progress on this set of schemes in the Assembly last week and he provided an update. To recap, three of the seven schemes are now complete with four still to be carried out. The table at the top of this page provides a summary of the current position. Firstly, he said on the Cornamuck scheme that the draft orders would be published in March 2015 (similar to what he said in June 2014, see previous update). The total cost of Cornamuck is given as £5m, again information we already knew. He also mentioned the Kilgortnaleague scheme where he said that early design work is underway. This has been the position since 2010, so that doesn't really represent much change. However, he did say that he hoped to announce the preferred corridor "in 2015" and for the first time gave a cost estimate, which is £6m. He did not mention the Esker Bog or New Park schemes. The overall impression is that this set of schemes is not a high priority, and it doesn't look to me as if any of the four oustanding schemes will happen in the near future. 19 Jun 2014: According to the recent DRD Roads Service report to Omagh District Council the draft legal orders for Cornamuck are due to be published "in the coming year". Progress seems to be slow on this one, since it's now over two years since the Stage 2 report was approved. Perhaps money is the issue. The document also says that design work is underway on Kilgortnaleague, although since this was also the case in the 2010 Omagh council report (see update below for 30 Dec 2010) it indicates little progress. The report makes no reference to Esker Bog, even though it seemed more advanced in the last update in April 2013 (below). Finally, there is no mention of the proposed upgrade to the bad bends at New Park, so I'm not sure if anything is still planned here. So it doesn't look as if we can expect to see much happening on the A32 in the next year or two. 24 Apr 2013: The Roads Service web site is now saying that the Stage 2 report for the Esker Bog scheme was approved on 27 February 2013. This at least indicates that design work is proceeding, but there is still no indication when the remaining four schemes on the A32 will be constructed. 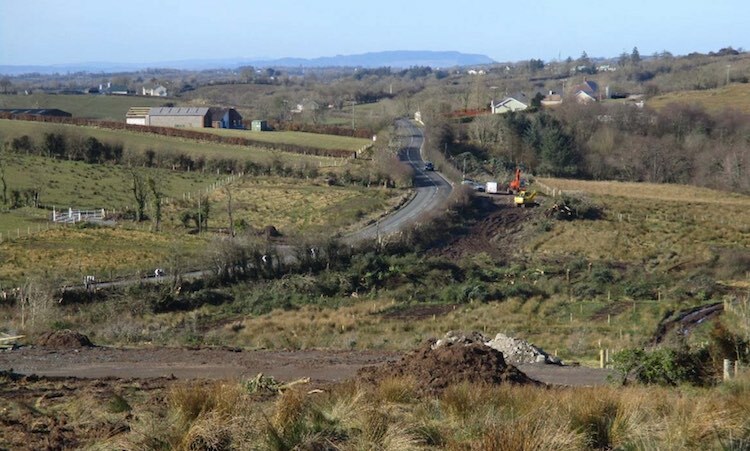 13 Feb 2013: Today the "Roads" Minister officially opened the Shannaragh scheme, which has been ongoing since last March. This is a month ahead of the expected completion date as announced last year, so well done to the contractor (Coffey Construction/White Mountain). The final cost is confirmed to be £7.3m. This scheme was the third of the planned upgrades to the A32, but the most expensive and largest of those carried out to date. In total 2.2km of new road has been built. The Impartial Reporter contains a photograph of the Minister with two people, presumably contractors, at the opening. They appear to be standing on the "new" Shannaragh Bridge, which lies a few metres east of the original bridge, which has been (or will be) removed as part of the road realignment. There are also three photos of the work (taken last September) on Flickr which gives you an idea of the scale of this scheme. 4 Jan 2013: There was an excellent article on this set of schemes in the most recent issue (page 45-46) of Plant and Civil Engineer magazine. The article explains some of the background to the proposals, and what has been achieved so far. It also notes that with pressures on budgets, only Shannaragh and Drumskinny were deliverable in the short term (the former is underway, and the latter completed). The Mullaghbane scheme was completed in 2009. The article suggests that Cornamuck and Esker Bog will be next. This just leaves the New Park and Kilgortnaleague schemes on the long finger. The article mentions the Sidare scheme, but does not mention that this scheme was apparently cancelled two years ago (see update on 10 Dec 2010 below). The article also includes a couple of nice images of the Shannaragh scheme underway, including one of the new bridge over the Owenreagh River that is required. The Shannaragh scheme still seems to be on schedule for completion in March 2013. It looks as if delivery of all seven elements of the A32 improvements could be some years away. 2 July 2012: The recently published report to Omagh District Council contained pictures of two current/completed schemes. The first photo shows the Drumskinny scheme which was completed in March 2012. The second shows early earthworks underway at Shannaragh, which began in March 2012 and will be ongoing until March 2013. The report also seems to confirm that Esker Bog and Drumskinny are in fact separate schemes, which explains the puzzlement in the previous update, and suggesting that Esker Bog is a future scheme. Earthworks underway at Shannaragh sometime during or before June 2012. 6 April 2012: I have not been in the area to check, but I am assuming that the Esker Bog/Drumskinny scheme has now been completed as it was timetabled to be finished last month. According to the Roads Service web site the Stage 2 report for the Cormamuck scheme was approved on 13 March 2012 with a cost of £5m-6.5m. This time last year (see below) the Minister said that the preferred option for Cornamuck would be published in late 2011, but so far nothing has appeared. (The Roads Service web site now says that the Stage 1 report for Esker Bog/Drumskinny was also approved on 13 March 2012. This makes little sense as that scheme is now completed, unless there is further confusion about whether this is made up of one or two schemes.) Work on the Shannaragh scheme appears to be ongoing. 3 Mar 2012: A press release issued on Thursday confirmed what we knew last month, ie that the contract for the Shannaragh scheme has been awarded, but added that work would be beginning on Monday, 5th March and be completed "by March 2013". It confirms that the total cost of the scheme is £7.3m, of which the value of this construction contract is £4.3m. This makes it the most expensive of the A32 scheme family to date, mainly because it is also the largest. 10 Feb 2012: The contract to carry out the Shannaragh scheme was awarded to Whitemountain Quarries Ltd / Coffey Construction Ltd Joint Venture on 27th January 2012. If work has not already started, it is likely to do so soon. This is slightly later than was anticipated last summer. There is no word on the remaining three elements of the A32 upgrade programme, namely Cornamuck, New Park and Kilgortnaleague which are still at an early stage of development. 21 Sep 2011: The contract to carry out the Drumskinny scheme was awarded to Fox Building & Engineering Ltd on 31st August, and a press release was issued today confirming that work is commencing. The same press release confirmed that the total cost of the Drumskinny scheme is now £1.8m, of which the construction contract represents £1m. The scheme will see almost 1 km of the A32 realigned and straightened to improve road safety. The completion date is given as "March 2012", ie around 6 months' duration. 4 Jul 2011: The Minister has given another update on this scheme via a Written Answer in the Assembly. Drumskinny is now due to get underway in September this year, while Shannaragh is unchanged with commencement still due in December. Cornamuck is still a "priority" but the implication is that there is not currently enough money to built it. 5 Jun 2011: The Drumskinny scheme is currently out to tender with a closing date of 16th June, while the Shannaragh scheme was out to tender during May. In a press release, Roads Service confirm that work on Shannaragh is due to begin in December this year with completion "in 2012", while Drumskinny will be completed "before the end of the current financial year", which presumably means by April 2012. The tender document states that the work will begin in "late August". Last month a serious road accident occured at Shannaragh, at one of the bad bends due to be removed by the scheme there. While we do not know whether the road alignment was a factor in this accident, it does nevertheless highlight the value of upgrading the A32. 25 Apr 2011: Due to the deteriorating financial climate, there is uncertainty over when the five remaining elements of this scheme will be constructed. In a Question for Written Answer last month, the Minister said draft orders for the Shannaragh scheme (the most imminent one) have now been published. He also said that the "preferred option" for Cornamuck (ie the design Roads Service would like to build) will be published "later this year". However, the Minister could not give any firm committment to progress with any of the schemes within a specific timeframe. The design documents for Shannaragh are on the DRD web site, but they don't seem to be listed anywhere. You can find them by going to this page and typing "Shannaragh" into the search box. Meanwhile, the tender for construction of the Shannaragh scheme was advertised on 12th April and will close on 25th May. This is earlier than expected, based on the information we had in December (see below). The Roads Service web site is also saying that the Drumskinny scheme may go to tender in May 2011. 7 Mar 2011: Roads Service have provided some more information on the progress on these schemes via a Question for Written Answer. It confirms what we already knew about the progress and gives new cost estimates - Shannaragh is now £7m (down from £8m in December), Cornamuck is £5.1m, and Drumskinny/Esker Bog is £1.4m. This press release issued on Friday suggests that some new money has been made available which may help some or all of these schemes to progress. 30 Dec 2010: Some clarity at last on the various schemes (see previous update) has come by scouring council reports from earlier in the year. Part of what I have found is a more up-to-date map by Roads Service showing the various schemes. I have included this map above. An update on each scheme is given below based on the Fermanagh and Omagh council reports from Spring 2010 as well as this more recent press release on the subject. On the basis of this new information I have re-written the text above to reflect the current position. The Mullaghbane scheme no longer appears in Roads Service documents, presumably because it was completed in 2009. See here for contract details. On the Shannaragh scheme, the legal orders and environmental statement are due to be published "in the coming weeks". The contract is scheduled to be awarded "late in the 2011/12 financial year", ie early 2012. This scheme alone is estimated to cost almost £8m. It seems that the Drumskinny scheme is actually an extension of the Esker Bog scheme, so they are being treated as a single scheme. Advanced site works took place early in 2010 with the main contract due to be released in March 2011, according to the Roads Service web site. There is no new information on the Cornamuck or New Park schemes. The Sidaire scheme which was to have been between Enniskillen and Irvinestown has now been cancelled "due to escalating costs associated primarily with very poor ground conditions and the necessity to acquire adjoining land and property". Design work is underway on the Kilgortnaleague scheme. 5 June 2010: According to this press release, work on the Shannaragh scheme is now expected to commence "in 2012", which is a year later than anticipated in November. Bizzarely, the press release also says that the Mullaghbane scheme "is nearing completion" despite the fact that a press release issued over a year ago claims the same thing! Strange time warps on the A32... So far only one of these eight associated schemes has been carried out. This press release notes that design work is being carried out on the Kilgortnaleague scheme at the Enniskillen end. The Sidaire scheme is still on the Roads Service "future tenders" list (release date Dec 2010), but the Esker Bog scheme has inexplicably now disappeared from the list. However, a new scheme called "Drumskinny" has now appeared (with a release planned for Sep 2010). This may be the same thing, or it may be a nearby scheme previously referred to as Cornamuck. Who knows? It is not helpful to the public if Roads Service are changing the names of schemes half way through the planning process! 23 January 2010: The Esker Bog and Sidaire schemes have appeared on Roads Service's "future tenders" list. The tender for the Esker Bog scheme is due to be released in August 2010, while the Sidaire one is due to be released in December 2010. 22 November 2009: This press release from last week outlines the current position on this scheme. The Esker Bog scheme will apparently commence "this financial year" subject to land acquision. This presumably means by April 2010. The Sidaire and Shannaragh schemes are expected to commence in "early 2011" subject to land acquisition and available funding. There are no updates on the remaining four schemes. 7 June 2009: According to this press release from about 3 weeks ago, the scheme at Mullaghbane was nearly completed while the scheme at Sidaire may proceed "later this year if land acquisition is successful". A public exhibition on the Shannaragh scheme took place on 28 May 2009. The current position, therefore, is that of the 8 schemes planned for the A32, one is completed with seven still to proceed. 11 Apr 2009: According to latest information, the scheme at Mullaghbane is actually underway now, with completion due in May 2009. Work apparently began there in late January and involves both carraigeway widening and realignment over a distance of 0.7km. The contractor is James Balfour & Sons Ltd. The same information states that the scheme at Sidaire is due to get underway next, likely by April 2010 (subject to acquisition of land) at a cost of around £800,000. Information on the Roads Service web site, meanwhile, suggests that the tender for the Esker Bog scheme will be released in Spring 2010. This suggests construction *might* happen in 2011. The remaining schemes are described as "a rolling programme" which we believe are to be completed by 2015. 2 Mar 2009: The Regional Development Minister answered a question in Stormont on the timescale of these improvements. In his reply, the Minister confirmed that the schemes would proceed separately, with only two of them (at Esker Bog and Sidare) being planned to open before the new hospital in Enniskillen opens (currently planned for 2012). The reply also mentions four of the other schemes which he says will open after the hospital. The reply makes no mention of the schemes at Drumbulcan and Mullaghbane. It thus seems as if these improvements will be provided over a period of several years, rather than all at once in a single contract. The reply also confirms that the DRD is contributing £10m, and the Department of Health £5m "to facilitate blue light services on this stretch of road". 2 Feb 2009: Over the past few months this scheme (or series of schemes) has been moved into the preparation pool, meaning that construction is anticipated within the next five years. In November 2008 a leaflet was issued about these proposals, the wording of which suggests that the various elements will be implemented separately, and that some will involve building short stretches of road offline. The leaflet gives the rationale for the project as being to "reduce journey times, provide a safer route and improve journeys for Accident & Emergency services".